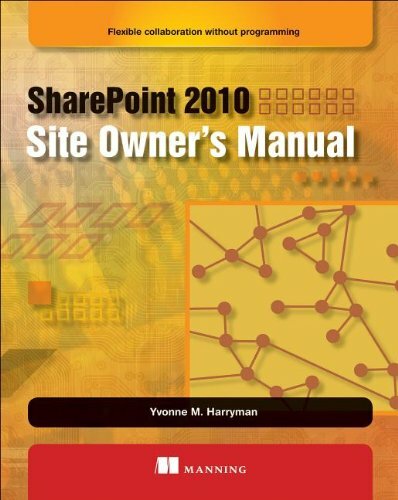 SharePoint 2010 Site Owner's Manual teaches you what SharePoint 2010 is all about and how to get started using it. The book also includes step-by-step scenarios for implementing real-world scenarios. You will learn how to build powerful sites leveraging SharePoint's out-of-the-box functionality along with other helpful tools such as InfoPath, Access, and SharePoint Designer. This book is a guide for business users without programming skills who want to build their own SharePoint sites. With it, you'll learn how to set up document sharing, trackable workflows, and many other business applications. You'll go step-by-step through real-world scenarios like content management, business intelligence, sharing information on the web, and search. Along the way, you'll learn how to interact with other business tools like Access, InfoPath, and SharePoint Designer. This book is designed for SharePoint users who want to become tech-savvy in configuring SharePoint's out-of-the-box functionality. No programming or system administration experience is required. View More In Social Media for Business. If you have any questions about this product by Manning Publications, contact us by completing and submitting the form below. If you are looking for a specif part number, please include it with your message.